In the end of 2014 the Open Contracting Partnership alliance supported by the World Bank Group established the OCDS meant to promote better open data experience. 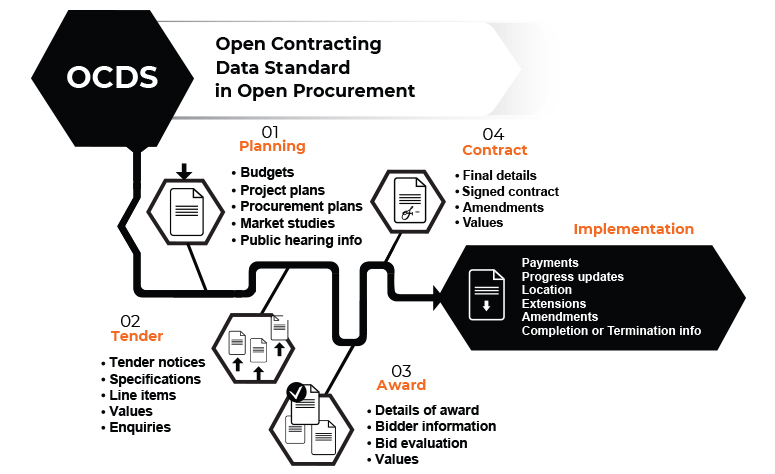 Open Contracting Data Standard (OCDS) is a recognised open data standard for organisation and structuring of information in the process of contracting. This open data standard makes important information sharable, re-usable and machine readable so that users and partners around the globe could merge it with their own data and gain opportunities for thorough analysis, new approaches, deeper insights and more innovation. What is more, due to OCDS there appears the possibility to relate the documents and other data collected by the governments with the initiatives of users willing to help with fixing problems, analysing information and bring in novelty solutions. Tendering information is provided in OCDS format due to the OCDS API which makes it possible to retrieve OCDS-structured data for further manipulations with tools and instruments requiring this data organization standard. Export of OCDS data is performed via a set of software tools ensuring transformation of database material into the OCDS format and storing it in OCDS API as retrievable specifically ordered datasets. Such OCDS data being processed, allows using them in analytical systems where they can be filtered and grouped according to individual user preferences in order to get answers to particular questions and insights. Marketplaces are able to exchange OCDS-structured information with the potential partners, purchasers and procuring entities worldwide since OCDS is a generally accepted data format around the globe. OCDS is strictly oriented on employment of the open data power with the aim to save government money, deliver better goods and services, prevent corruption and create a favourable business environment. 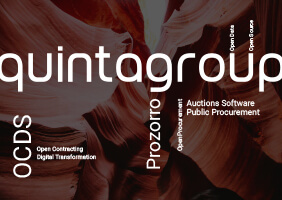 One of the most important points in the development of the OpenProcurement toolkit for ProZorro project was the need to find a tool enabling users to track government contracting process and make use of the data generated in this process. OCDS appeared to be an irreplaceable element of our OpenProcurement solution assisting in retrieval of well-structured data that reflects the complete procurement contracting cycle starting with planning through tendering and awarding procedures to contract conclusion with its further implementation. Therefore, the procedure of releasing data and associated documents at various stages of the contracting processes is precisely described, offering a framework for governments to continuously collect and publish their information. 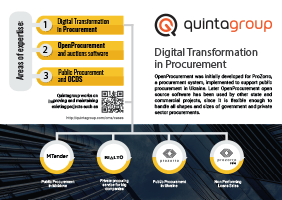 Within the OpenProcurement context, all this results in public access to information related to the process of public procurement making it transparent, open to the society, controlled by the authorities, fair and honest, free of malicious schemes and corruption, money saving and efficient. ProZorro tendering data releases are published in continuous mode whenever a change occurs in the contracting process through the OCDS API built on the basis of OCDS v. 1.1 specifications. A sufficient amount of information is also supplied by an extension mechanism enabling to provide additional data not premised by the OCDS v. 1.1. ProZorro is not the only system in Ukraine publishing OCDS data - ProZorro.sale, bank asset selling electronic system, is planning to incorporate it as well. 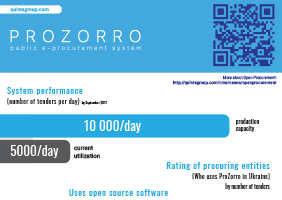 ProZorro OCDS code can be reached at https://github.com/openprocurement, and for OpenProcurement's API documentations you can visit http://api-docs.openprocurement.org/. The Georgian electronic Public Procurement system functioning since 2011 had collected a great amount of valuable and important data, though they weren’t properly structured and, therefore, hardly accessible and usable. With the introduction of OCDS into the system, Georgian dataset has become more structured, filterable, comprehensible and analysable. New portion of procurement data generated according to OCDS v. 1.1 is released every 3 days. This is a bulk package of static json files which is downloadable as a ZIP archive accessible at the link provided on Georgian Public Procurement Open Data web page or available in JSON format through OCDS API. It contains all tendering data accumulated until the current release date. In addition, there is a download link to an XLS file containing tables with these data in flattened format. All in all, OCDS incorporated in the Georgian e-procurement system now enables analysts and citizens to work with joined-up data, provides definite criteria for a well-structured presentation of the data, describes in detail the procedure of releasing data and the associated documents at various stages of the contracting processes and offers a framework for governments to continuously collect and publish their information. API-accessible service offering Analytical Tools for OCDS datasets, predictions based on machine learning modules and AI integrations.